Leftover bread can be used to make bread pudding. It can also be toasted and crumbed to sprinkle on soups or salads. Leftover cooked vegetables can be turned into a paratha stuffing or a vegetable filling for a sandwich. They can also be combined with low fat cheese and baked, to be eaten with bread. Another way is to use them in an omlet. Leftover raw veggies can be boiled together to make a soup which can be a filler or a starter for a meal. Leftover dry dal can be used in a paratha or can be mixed with boiled vegetables and turned into a sambar. Dry boiled dal and boiled vegetables can be mixed together, mashed, shaped into rounds or ovals, and steamed to make a delicious and healthy snack. Leftover plain rice can be turned into lemon rice or tamarind rice. Leftover pasta can be combined with raw vegetables and a suitable dressing, to make a salad. Leftover boiled eggs can be cut in half, the yellow scooped out and mixed with vegetables and masala, and filled into the boiled egg white 'cups'. Makes a yummy snack. Leftover coffee or tea decoction can be frozen in ice trays. These coffee and tea cubes can be later used to make iced coffee or iced tea. If using leftovers does not appeal to you, donate it to the needy people. While it's good not to waste food, it's also important to remember to throw away food that is stale or spoilt. Try your best to reduce leftovers and eat fresh food as far as possible. 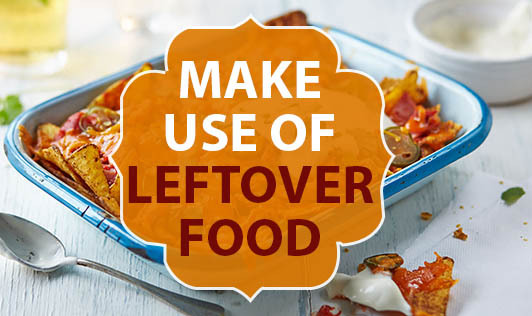 If you have any tips to share on leftover foods, do write to us!